I don’t quite recall how I found Dallas’ blog, Day-by-Day Masterpiece. Maybe she found mine. All I know is that Dallas and I started emailing back and forth and realized we had a lot in common–a love of food, books, friends, etc. But more than that, she was in grad school at Purdue University in West Lafayette, Indiana, which happens to be my hometown. AND her grandparents [all four of them] graduated from Wittenberg University in Springfield, Ohio… my alma mater. What a small world. 🙂 We got to meet up once for a lovely coffee date at Panera before she moved back to California, and that was great fun. We’ve kept in touch over blogs and the occasional email. As a longtime newspaper columnist Woody Woodburn is often asked to speak to civic groups – and the person audiences invariably want to hear more about during the Q&A afterward is Coach John Wooden. Listeners at these talks, as well as readers of Woodburn’s national award-winning columns, over the years have encouraged him to write a book about his experiences with Coach. Now he has with the memoir Wooden & Me: Life Lessons from My Two-Decade Friendship with the Legendary Coach and Humanitarian to Help “Make Each Day Your Masterpiece.” It was in 1987 as a young sports writer and near-newlywed that Woody met Coach, who soon became a friend and mentor through the births of Woodburn’s two children and their growth into young adulthood; the death of Woody’s mother; career decisions; and more. … Just as Coach John Wooden was beloved and revered by people of all ages and all backgrounds, readers from teens to parents to grandparents, basketball fans and non-fans alike, will find Wooden & Me enlightening and inspiring. I loved how well written and well researched this book was. As a librarian, quality is SO important to me, and sometimes with memoirs the research aspect can take a backseat because the author knows the person/subject so well. Not so with Woody Woodburn. You can tell he’s a good author from the beginning, and it shows. I loved how passionate the author was about not only writing about his and his family’s friendship with Coach Wooden but also about teaching his readers about Coach Wooden’s philosophies. This makes the book very encouraging and motivating. For me, probably the most challenging thing about reading memoirs [and even blogs too] is that it can feel somewhat intrusive to get that much into someone’s life–especially someone you don’t even know! I feel like the author has found a good balance between being open about his life and family, without being too revealing. On the flip side of that, part of what makes memoirs and blogs so enjoyable is the opportunity to connect with the author. Though I’ve never been a UCLA basketball fan or even truthfully a fan of John Wooden, I did feel a certain attachment to him because he’s a Purdue grad. I loved learning more about him and his commitment to education and teamwork, things that are missing on some college sports teams these days. It’s so inspiring to consider his legacy too! This is a quick read, but it’s also a book to savor over and enjoy bit by bit because of the wisdom imparted here. 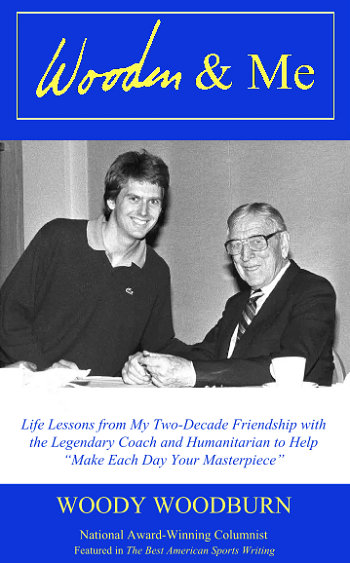 Dallas has been celebrating her father’s book and Coach Wooden on her blog this year so you can follow along here and get a taste of the book all year long! Thank you so much to Dallas and Woody for thinking of me and allowing me to review such a great book. Disclosure: I received a complimentary copy of this book from the author. However, I was not required to write a positive review. The thoughts expressed above are entirely my own. Thanks for the chance to read this great book! Sarah, thank you SO much for such a wonderful & thoughtful review of my dad’s book! He is going to be thrilled. You are the sweetest. Have a wonderful rest of the weekend!